‘Flowers, cold from the dew. And autumn’s approaching breath.’ - Anna Akhmatova, an excerpt from "The Complete Poems of Anna Akhmatova." It’s been one of those grey months, when the fervour of the Earth begins to shiver and withdraw. Time turns to stone. And all things bloom within the night. Autumn is my forever season. The bitter one. It hits and chokes and stifles and it’s there and it’s like it never left. It’s hibernation. Better than Winter when all I desire to do is burst forth and out of my skin, better than Summer when all I can do is withdraw, and better than Spring when rejuvenation leaves me dead. It’s slowness, stillness. There’s no warmth on anything. But there’s blossoming. There’s always blossoming. And as we wash the last of season off the stains of our skin, I wring my hands with her blood and tremble, for I never want the biting touch of Autumn to leave. 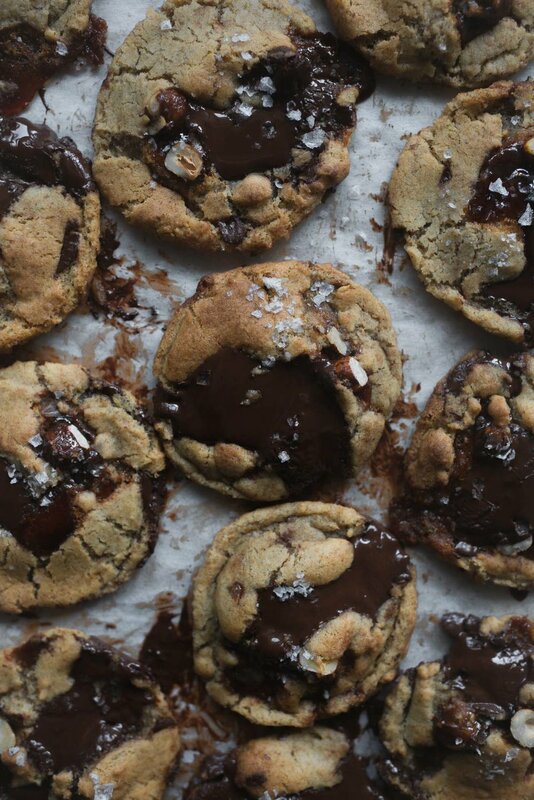 Hazelnut Praline and Rye Chocolate Chunk Cookies. It’s a rendition a little different from the rest. You could say that the Classic Chocolate Chip Cookies in the archives of the blog are made for Summer, and the Spelt Dark Chocolate Chunk Cookies are destined for Winter, but these, these are my Autumn’s. There’s toasted intensity, heartiness, and warmth from a little hint of wholesome rye. A slight ashen note from just burnt hazelnut praline. And puddles and pools of molten dark chocolate. A sprinkling of flaked salt, too. I forecasted it. The rye flour gives these cookies a depth like nothing else. If you don’t have rye on hand, you could substitute it for the same amount of spelt flour. Or, if you prefer, you could do the recipe without it by substituting in all-purpose flour. I use a dark chocolate block (not chips, wafers or callets) that contain a minimum of 70% cacao solids. The slight bitter edge compliments all the cookie sweetness perfectly. Try to use the best quality block of dark chocolate you can find. I only ever use a block that I wouldn’t just bake with, but that I would eat. You should get about 30 - 32 cookies out of the dough by using a small cookie scoop (1” or 2.5 cm) or 1 tbsp. as a measure. And you should be able to fit 8 cookies per sheet. If you’re planning to bake all the cookies off at once, simply leave the remaining dough balls in the refrigerator whilst the other cookies bake, or, seal and store them in the freezer, to bake off later. Chop the dark chocolate roughly. And I mean roughly. The larger the chunk, the easier it will spread into a molten pool of chocolate. Just make sure that the chunk is of a size that can easily fit into the cookie scoop and be rolled into a tablespoon sized ball. The above dough ball photo should help guide you. I like to use a tapping technique inspired by The Vanilla Bean Baking Book to help spread and melt the chocolate within. The technique gives the cookies those surface based pools and puddles of chocolate. You don’t have to do it, the cookies can be baked off regularly. But, if you want the chocolate pools, it’ll help achieve that. It’s something a little extra that makes a slight alternation in appearance. The delicious cookie taste remains the same, regardless. Line a baking sheet with non-stick parchment paper and place the hazelnuts in the center of it. Set aside. Place the granulated sugar in a medium sized saucepan set over medium-low heat. Heat, swirling the pan occasionally but not stirring, until the sugar is dissolved. Increase the heat to medium and continue to cook, again, swirling the pan, until the sugar is uniformly deep amber in color, about 5 minutes. Remove the pan from the heat and pour the burnt sugar all over the hazelnuts. Set the praline aside until it has completely hardened, about 15 minutes. Once hardened, chop it into roughly small sized chunks. Pre-heat the oven to 180 c (350 f). Line two large baking trays with non-stick parchment paper. Set aside. Place the butter into a medium sized saucepan, set over medium-low heat. Heat, stirring occasionally, until the butter is melted. Remove from the heat and pour the butter into a large mixing bowl. Add in the light brown sugar and granulated sugar. Whisk until smooth and very well combined, about 1 minute. Whisk in the egg and vanilla bean extract. Set the bowl aside. In a separate medium sized mixing bowl, whisk together the all-purpose flour, rye flour, baking powder, baking soda, and salt. Using a large wooden spoon, incorporate half of the dry ingredients into the bowl with the butter and sugar until just combined (some dry flour pockets should remain). Add in the remaining dry flour ingredients. Again, mix until just combined. Fold the dark chocolate chunks and praline pieces into the dough, until evenly incorporated. 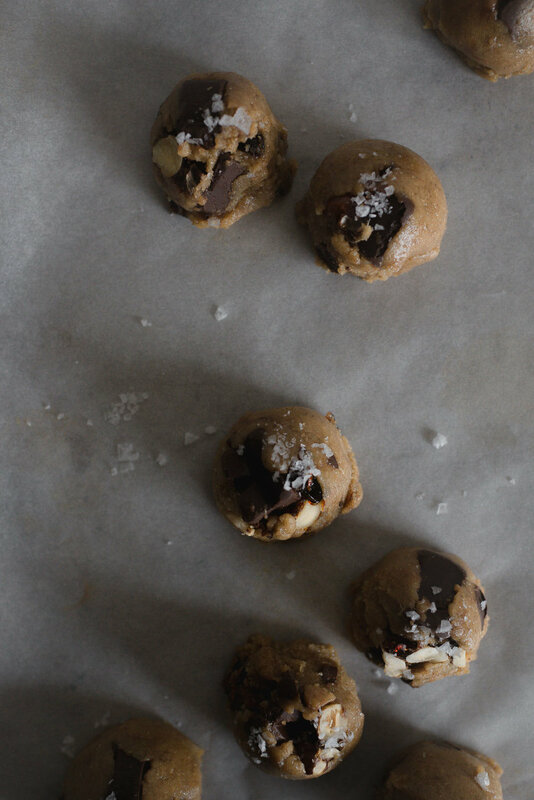 Using a small cookie scoop, or a generous tablespoon as a measure, roll out as many cookie balls out of the dough as possible. As you’re rolling out the balls, make sure that a chocolate chunk is at the top of each dough ball (this will help form those chocolate puddles). Arrange the balls evenly amongst the baking trays, then, sprinkle over a little of the flaked salt. Bake, for 8 to 11 minutes. Open the oven door half-way through baking and raise the cookie sheet by a few inches, then, use a little force to carefully tap the sheet against the oven rack so that the cookies deflate slightly. You should see the chocolate begin to spread. Close the oven door and let the cookies continue to bake, for a further minute. Again, repeat the raising and tapping process above, for a total of 3 times. When done, the cookies should be beginning to turn golden and are just set around the edges, but with molten chocolate puddles throughout. Remove from the oven and let cool for 5 minutes, before carefully transferring the cookies to a wire rack to cool further, before serving.